Worship choruses and special music are led by a praise band consisting of acoustic and bass guitars, keyboards, drums, congas and vocalists. The Praise Band helps to blend contemporary Christian music into a traditional style of worship. From time to time, there are opportunities for children's and youth choirs to share their talents with the congregation to the Lord's glory. In addition, members of the congregation frequently share their vocal and musical gifts. Our Chancel Choir director is Mrs. Susan Hood. 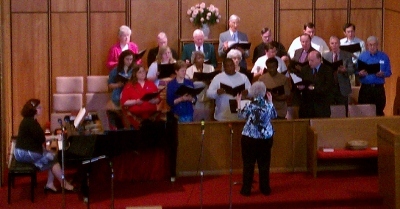 Our Chancel Choir sings worship anthems from September through May. Many different styles of music are presented by the 15-25 voice adult choir. Practice is on Wednesday nights following Bible Study and is open to any adult who wants to sing to the Lord.